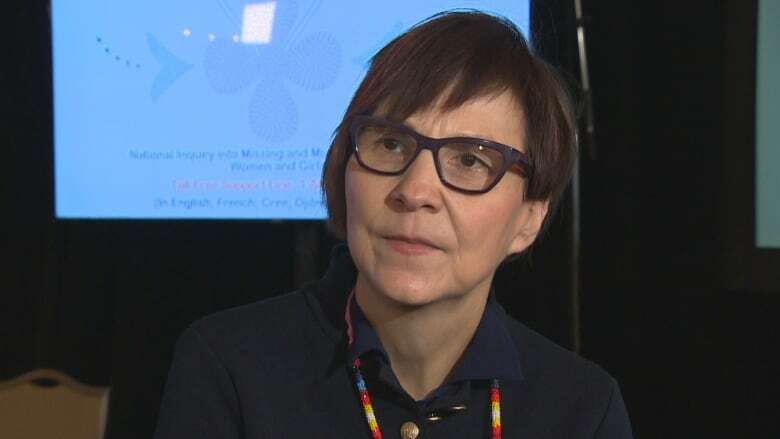 Cindy Blackstock, the executive director of the First Nations Child and Family Caring Society of Canada, testified Wednesday at the MMIWG national inquiry's institutional hearing on child welfare and family violence in Winnipeg. An advocate for First Nations children says the death of 15-year-old Tina Fontaine proves the "direct link" between the child welfare system and missing and murdered Indigenous women and girls. "Tina Fontaine is that direct link," said Blackstock. Tina's body was pulled from the Red River in 2014. She was in the care of Child and Family Services at the time of her disappearance. Her great-aunt, who was a long-time foster parent, asked CFS for help because the teen was having trouble dealing her father's 2011 murder. "We need to understand that these children often have traumatic experiences before they come into care but then often in the care system, because it is so under resourced, those kids have additional traumas, which predisposes them to other types of risk," Blackstock said. She said she is concerned by the overrepresentation of First Nations, Inuit and Mé​tis children in the child welfare system. The more children are moved around, from placement to placement, the higher their risk for mental health issues and addictions, Blackstock said. She has spent her career fighting for equal rights for First Nations children, including a decade long battle with Ottawa. In 2016, the Canadian Human Rights Tribunal ruled that Canada discriminates against First Nations children on reserves by failing to provide the same level of child welfare services that exist elsewhere. It ordered the federal government to implement Jordan's Principle, which cuts through red tape so First Nations children receive health care without delay caused by arguments over who should pay the bill — the federal government or the child's home province. "No province or territory has adopted a Canadian Human Rights Tribunal-compliant definition of Jordan's Principle," Blackstock testified Wednesday. She said Manitoba has implemented a narrow scope of the principle, which applies to children with special needs, like Jordan River Anderson, for whom it's named. The child from Norway House died in 2005 in a Winnipeg hospital while the governments argued over who should pay for his care. Blackstock called at the inquiry on Wednesday on all levels of government to comply with the ruling, saying it's their responsibility to provide substantive and equal services for Indigenous women and girls. "If you're not accepting that responsibility and just relying on the feds to pick up the slack for you, which they won't in many cases, then what's happening is we are creating and perpetuating conditions that place Indigenous women and girls at greater risk for violence." The national inquiry is nearing the end of its mandate to collect evidence. Commissioners are expected to submit their final report by the end of April. The final hearing takes place later this month in St. John's, where the inquiry will hear expert testimony on sexual exploitation and human trafficking.